Eve Of The War • View topic - Revenge of the Sith Hits DVD Nov. 1! Revenge of the Sith Hits DVD Nov. 1! Post subject: Revenge of the Sith Hits DVD Nov. 1! This November 1st will be a landmark day for fans to celebrate the saga with two major releases in "Star Wars" home entertainment. The explosive and emotional finale to the saga, Star Wars: Episode III Revenge of the Sith, arrives on DVD and "Star Wars Battlefront II," the sequel to the most successful "Star Wars" game ever, arrives on Xbox, Playstation 2, Windows PC and Sony PSP formats. Lucasfilm and Fox Home Entertainment present a two-disc set for the "Revenge of the Sith" DVD, with uncompromising picture and sound mastered directly from the original digital source material. The DVD will include a brand-new full-length documentary produced by Lucasfilm Ltd. as well as two new featurettes -- one that explores the prophecy of Anakin Skywalker as the Chosen One, and the other that looks at the movie's amazing stunts. A 15-part collection of Lucasfilm's groundbreaking web documentary series, Making Episode III, will also be included in the set. A two-level playable demo of Star Wars Battlefront II is also included on the DVD. 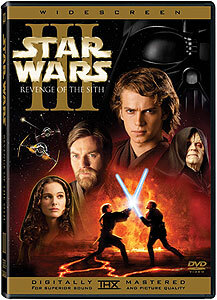 "'Revenge of the Sith' gave audiences an extraordinary experience, and we want this DVD to do the same," said Jim Ward, Vice President of Marketing and Distribution for Lucasfilm Ltd. "From the beginning of production, George wanted to be sure we chronicled everything that went into the making of 'Episode III' specifically to create an incredible DVD experience. This DVD has literally been three years in the making, and it's going to be a fantastic way to complete the Star Wars saga at home." In addition to its November 1st debut in the U.S. and Canada, "Revenge of the Sith" debuts on DVD in most major territories around the world on or about the same day. For those who actually want to live out the action of the "Star Wars" universe, there's "Star Wars Battlefront II," available on the same day. LucasArts' sequel to the smash hit "Star Wars Battlefront" adds all new space combat, playable Jedi characters, and never-before-seen environments straight out of Episode III to the hard-hitting action. In addition to the group combat, "Star Wars Battlefront II" also has an all-new single-player experience that transports gamers through an epic, story-based saga centering on Darth Vader's elite 501st Legion of stormtroopers. That's good news for the Star Wars fans among us. Location: Inglewood, South CA, U.S.
November will be a very good month. What will happen then, aside of the Special Edition of the '53 WOTW movie? Doctor Who Christmas Special with the new Doctor, that's what. Are you getting the new Doctor Who in the Netherlands? I don't know, I'll keep an eye on the advertisements and the Internet on that. Notice how there's no scar on Anakin's eye. Hopefully they'll fix that. November: Star Wars, War of the Worlds (Spielberg and Pal), and hopefully Fantastic Four, Batman Begins, and Land of the Dead. Different new and old movies. Sounds great! Do you mean in Return of the Jedi? No, in Revenge of the Sith. Throughout the entire movie Anakin has a scar on his eye. But they didn't put it on the cover. Got it. Bad mistake. Have you seen the clone Wars cartoon where he gets the scar? Nope. How does he get it? *sits down around a campfire* Yes. Tell us. Put some more wood on that fire will you? yeah sure. *dumps a whole tree in there* Whoa! Look at that sucker burn! Nice. Can it get so hot that Satan himself would think it too hot? All we need is an 80 KrK X-Ray (the most powerful Heat-Ray in the PC Game of WOTW).